Find 1 secret Wizard Card. Find 4 Secret Areas. 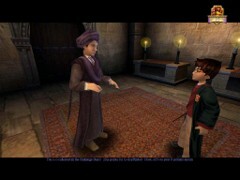 [3.3] Professor Quirrell is giving Harry instructions on the Lumos Challenge: You may begin the L-Lumos Challenge to p-practice the Spell. F-follow me, Mr. Potter. 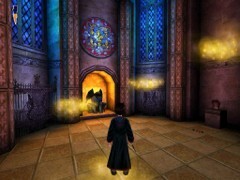 In the next room Quirrell shows Harry the statue of a Gargoyle: Hold d-down the mouse b-button to aim a Spell. To c-cast Lumos, let g-go the b-button. You may p-practice on that G-G-Gargoyle. D-don’t d-d-dawdle, Mr. Potter. C-cast Lumos on the statue to expose the c-correct p-p-path. That’s q-quite b-b-bright, isn’t it? Now you c-c-can c-cross the chasm and c-collect your Challenge Stars. I’ll meet you at the end. Walk over the Cloud and collect your 1st Challenge Star on the opposite side. Approach the door and it will open. You’ll be entering what looks like an empty Cathedral. Turn right and break the two jars with Flipendo. Each will offer a Bean. Turn around and cast Flipendo at the switch on your right side. That will open the two grilled doors. 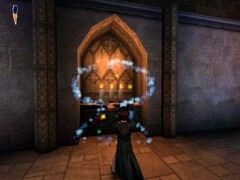 Take the entrance to the right and cast Alohomora on the alcove with three lit candles on your right. Go inside the Secret Room and open the chest with Alohomora for many Beans. 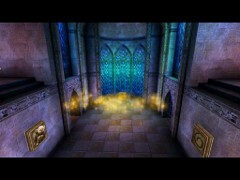 Go out this room and cast Lumos to the Gargoyle on the right. A camera view will go to the Cathedral’s ship and show a Magic Cloud being formed higher up. Go out and cast Flipendo on the opposite switch. That will also open both grilled doors on this side. Go inside and past the second door enter an octagonal room with a Gargoyle and two jars on a pedestal. Break the jars with Flipendo for a couple of Beans and cast Lumos on the Gargoyle. Four Magic Clouds are then charmed in this room. Jump on the lowest Cloud and further from Cloud to Cloud to the balcony on the second floor. Cross the Magic Cloud to the opposite side and grab your 2nd Challenge Star. At the end of this corridor cast Alohomora on a chest and get out the Beans. Follow left to the Gargoyle and cast Lumos. A long section of Magic Clouds is formed past the Save Book on your left. 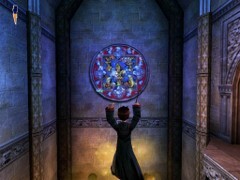 [3.4] Cross the three Magic Clouds and cast Alohomora on the circular colored pattern on the far wall. Jump to the round opening and collect your Wizard Card #37: Cassandra Vablatsky, 1894-1997. Celebrated Seer and author of “Unfogging the Future”. Go out of the room and jump to the first Cloud and from there to the balcony on your left. You’ll be entering a new room with two jars and three arches. Break the jars with Flipendo for an extra couple of Beans and go through the arches on the opposite side. Cast Wingardium Leviosa at the statue on left and move it onto the plate on your right. That will open the gate to the Gargoyle between the two stained glass windows. 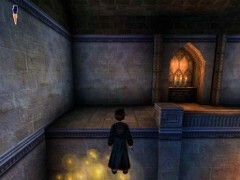 Cast Lumos on the Gargoyle and you will be shown how a vertically floating Magic Cloud is charmed in the large room. Return to that room and jump on the Cloud when it’s near the floor. Ride to the second floor and jump. You are near an alcove with three lit candles. 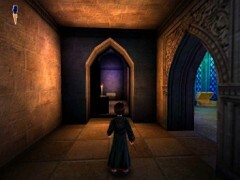 Cast Alohomora on the candles and enter this 3rd Secret Area. Cast Alohomora on the chest for the Beans and seize your 4th Challenge Star. Leave and follow left. Enter the room further on your left with a bright painting and a Gargoyle. 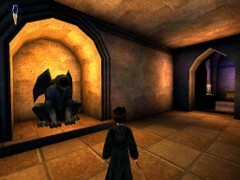 Cast Lumos on the Gargoyle. Turn around and cross the gap by the newly formed Magic Cloud. Jump into the opposite room with a Flipendo switch and another Gargoyle. Flipendo on the switch will open the gate on your left side. 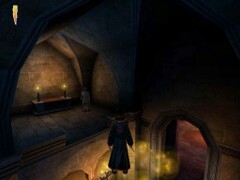 Lumos on the Gargoyle will form a Magic Cloud to the balcony with the Star in the large room. Leave through the new exit and follow all the way left till the corner. Jump to the Magic cloud and to your 5th Challenge Star. Follow the passage to your next Save Book. 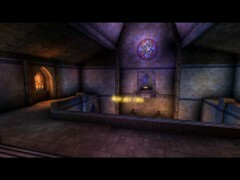 [3.5] Now you’ll be entering an octagonal kind of Mausoleum in the middle of a circus. 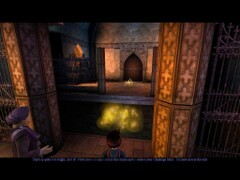 Don’t enter the Mausoleum yet but turn left into the circular passage and enter the room with the Chocolate Frog on your left. Eat the Frog and cast Alohomora on the chimney stone between the two lit chandeliers. Cast Alohomora on the chest for more Beans and another Choky Frog. Go outside and continue straight into the Mausoleum. You’ll spot a Challenge Star in the center of it. 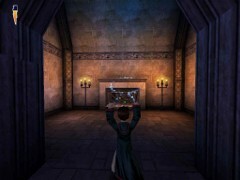 As soon as you’ll capture this 6th Star, all doors to the Mausoleum seal off and... Peeves flies in. This fight is a bit harsher than last time. So keep an eye on both of the health meters and avoid the Bludgers Peeves is constantly throwing at Harry. 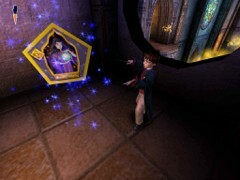 Cast Flipendo until Peeves’ health meter is fully down, and he’ll flee off, opening all doors again. The exit door is on the opposite side of the entrance you came in. Approach the door, it will open and you may save again by the Book. [3.6] Turn left and cast Lumos on the Gargoyle hidden in the dark on your left. That will make the door close again and charm a Magic cloud sliding over the next gap. Stand on the balcony and watch the Cloud approach. Then, jump on it and ride it till the ledges on both sides. Jump to the ledge on your right first. Immediately turn right under a couple of arches, grab the Chocolate Frog and cast Flipendo on each of both jars on a pedestal. Harry will have increased his stamina and obtained some more Beans. Leave and continue right to a room with two chests. Open each chest and extract a whole lot of Beans. Follow down the stairs on your left. Be careful by the second set of stairs. A hatch on the opposite side will open releasing an attacking Doxie. Quickly make it vanish with Flipendo. 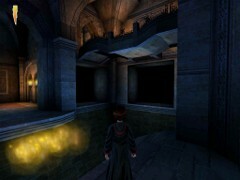 In this dark room turn left and jump to the platform around the central pillar of a tower. 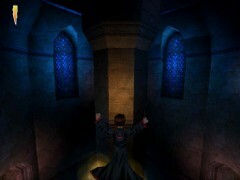 Run around the pillar and jump further to the ledge with the Star. 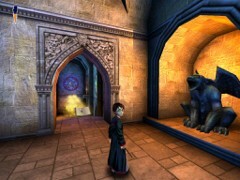 Catch the 7th and final Challenge Star and enter a room with a Chocolate Frog and a boy that is lost. Eat the Frog and open the chest with Alohomora for a whole bunch of Beans. There is a door with a lock. Enter the room with a Flipendo switch and cast a Spell on it. You’ll trigger a 3 parts bridge being formed above the gap with the sliding Magic Cloud. Backtrack all the way to the room with two chests, continue right till the gap and wait for the sliding Cloud to approach. Look up to the newly constructed bridge. Jump to the sliding Cloud and to the opposite side. As soon as Harry lands a hatch will open with another attacking Doxie. Solve this pesky problem with Flipendo. Turn left under the arches and cast Lumos on the Gargoyle on your right. 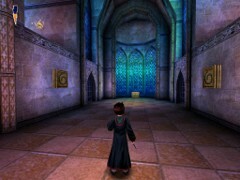 You’ll watch a cut scene showing a vertically floating Magic Cloud back on the opposite side of the gap near the arches. Jump back to the other side over the sliding Cloud and climb the new Cloud lift when it is near the floor. Ride to the top. Jump to the ledge on your left. Here you’ll meet Nearly Headless Nick again: Hello again, Harry. Clever lad! You’ve found my secret napping place, shh! Turn left and cross the bridge to the opposite side avoiding the Save Book on right side for now. There is a room with a Gargoyle in the dark. Cast Lumos and watch how a Magic Cloud is charmed orbiting the central pillar of the tower higher up. Return to the bridge, turn left and save by the book. 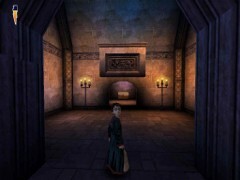 [3.7] Turn right inside the circular passage and follow till the end where you’ll spot a chest. Open it with Alohomora and get some more Beans. Follow the passage all the way around to the other end and catch the Chocolate Frog if you like. Return halfway and enter the balcony on your left. Wait for the Magic Cloud to arrive and jump on it. Ride to the opposite ledge and jump off. Professor Quirrell is waiting for Harry: You c-c-collected all of the Challenge Stars! 20 p-points for G-Gryffindor! Now, off t-to your P-potions lesson.